Note: I’m going to write about Café Gray on a separate post. I know probably a few of you might have seen the photos but I’m not going to talk about them today…but sometime very soon. On Monday, I went was around Union Square during my lunch break since I have about an hour and ten minutes after commuting down there via the subway. Since I’m tired of eating at City Bakery and I don’t want to eat sweets that day, surprisingly (probably due to the fact that I was semi-sick? 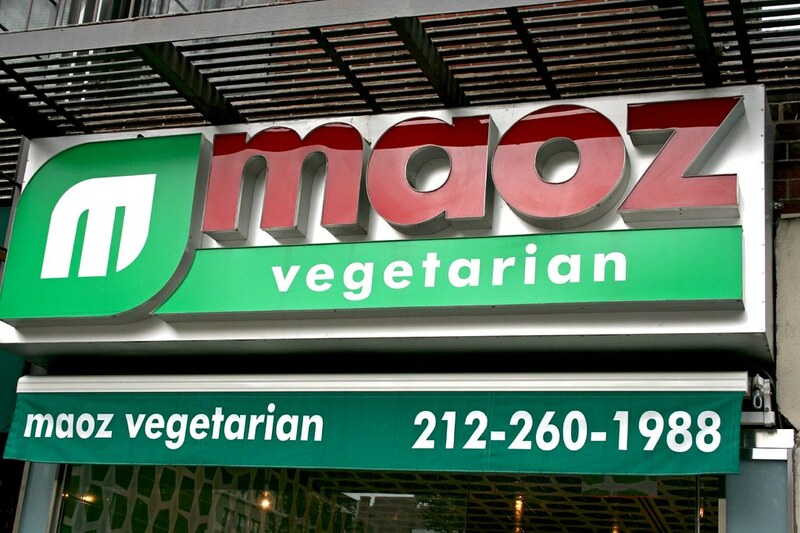 ), I went to Maoz Vegetarian. 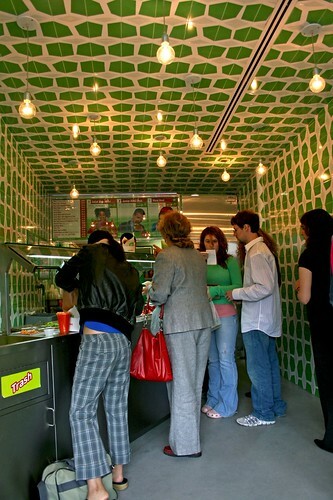 Stepping into this narrow, cramped, bright green, psychedelic patterned take-out joint, it’s a bit hectic. 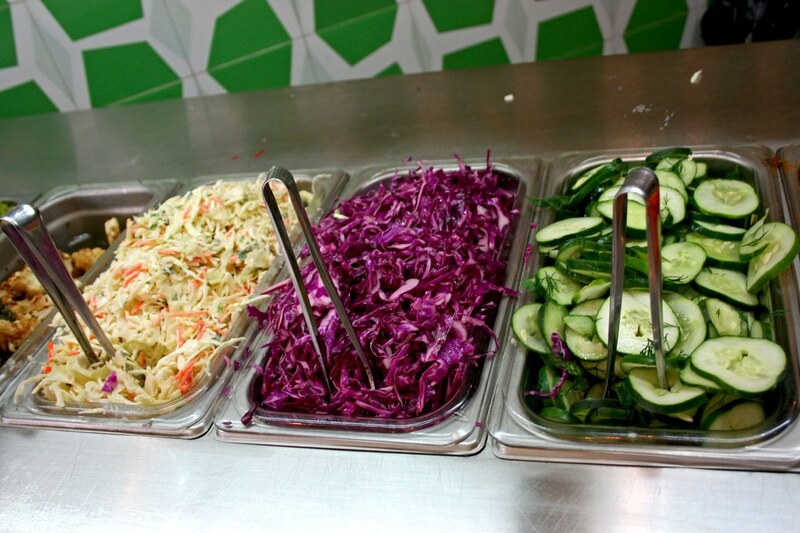 Given that it is lunch hour, students from NYU and local workers around the area are pouring out to grab some food but fortunately, the wait isn’t so bad. Once I got my order, Meal Deal #1, which consisted of their Royal sandwich, fries, and a drink (which I chose a bottle of water), I plopped my stuff on one of the three chairs, and I went back to the salad bar and added a few of their veggies from the bar even though the sandwich itself looks pretty packed. I didn’t try their spicy sauces due to the fact that I was sick and I don’t want to blow out my throat since I don’t want to get in a worse condition that what I’m feeling at the moment. I ended up stuffing my sandwich with a chunk of marinated tomato, roasted cauliflower, and topped it off with some tzatziki sauce on top. The sandwich looks like it’s about to keel over from so much stuffage in it. 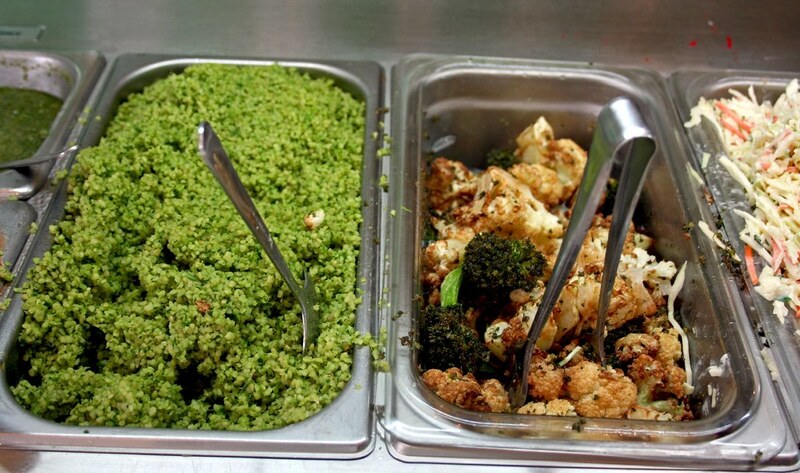 The falafel balls itself tasted pretty good. It’s crisp on the outside, well seasoned, and slightly moist on the inside. 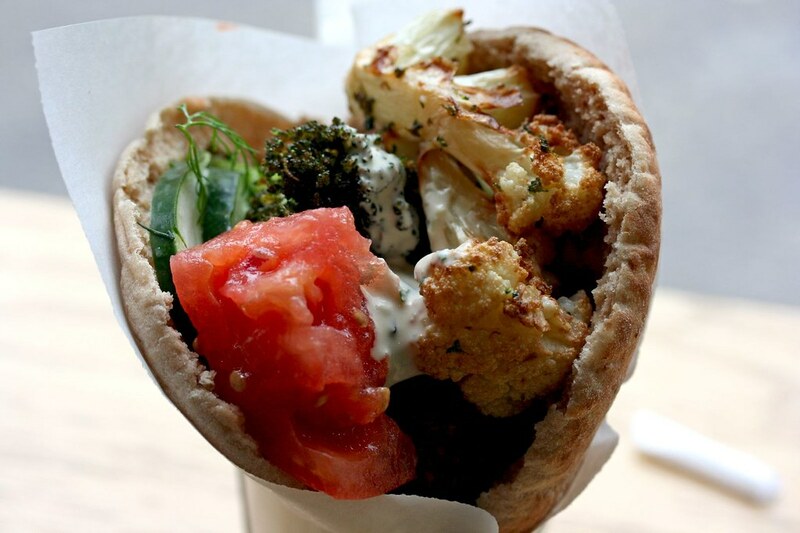 The whole wheat pita was pretty much the typical stuff one can get from a grocery store, nothing special. 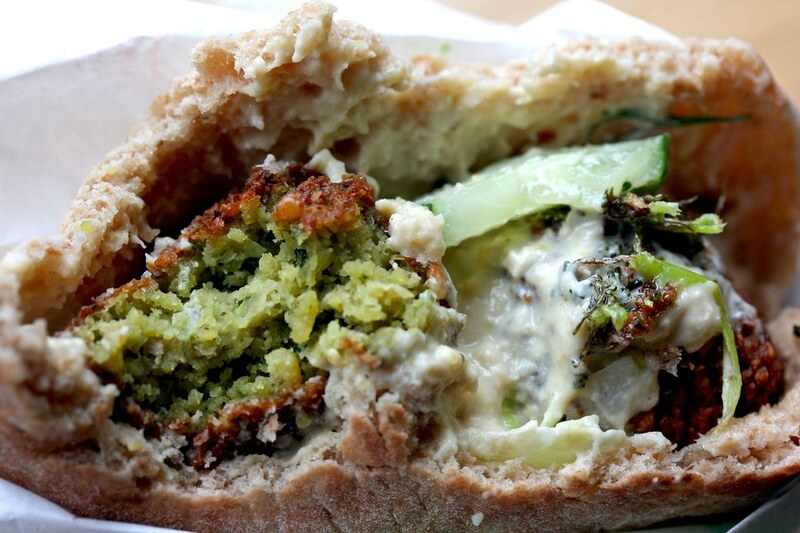 My qualms with this particular sandwich is the fact there’s supposed to be eggplant in here but it’s just one meager chunk and the composition of the sandwich is uneven, in other words, you get a ton of falafel balls on the top of the sandwich but once you eat toward the bottom of it, that’s where most of the hummus and lettuce are located. I want a little bit of everything in one bite. I didn’t bother taking a photo of the fries just because none of the photos I’ve taken looks appealing. It tasted fine but they were limp and soft. 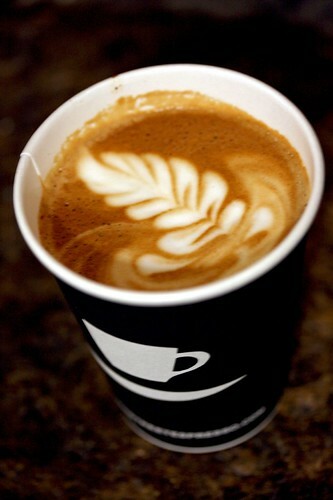 On Tuesday morning, I wanted some espresso so I went to Chelsea Market for Ninth Street Espresso‘s cappuccino. Yeah, I love coffee and espresso, not just because of the caffeine but it’s lovely aroma and flavor. Anyway, it’s a very good cup with lovely crema and robust espresso flavor. There was a slightly better purpose of going down to Chelsea Market was to pick up a scone (from 202) and a mini baguette from Amy’s Bread for tasting the fig jam that Robyn brought back from her Italian vacation. Once I got to Serious Eats after classes, I met Ed (in case you don’t know by now, he’s the head honcho of S.E.) once I got out of the elevator, I inquired about Robyn’s whereabouts since she’s not at her desk. He told me that she and Raphael went to the local Starbucks to try out the T-Mobile’s Hotspot Wi-Fi on his iPhone. Since Alaina‘s the only person at the office, we exchanged greetings and she told me that Robyn brought a bunch of cookies from home, that I could help myself to. 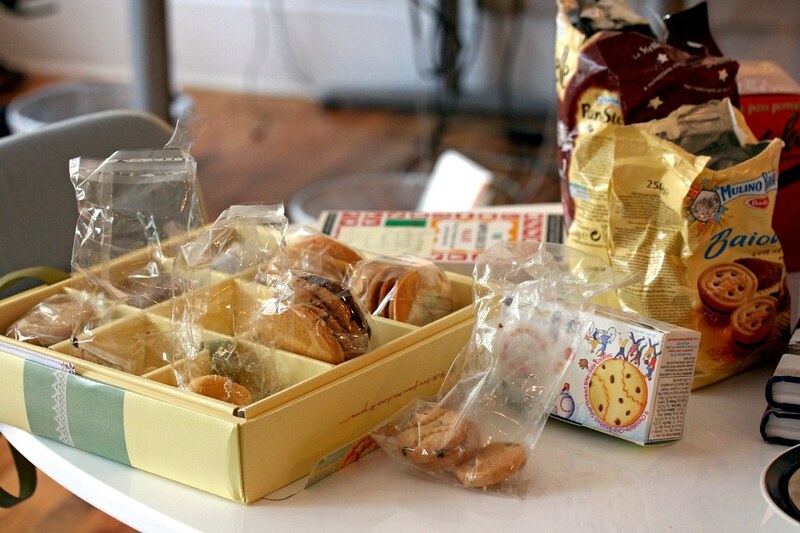 When I looked over at the table I saw the raided bags and a large box of cookies: the Stelle cookies that Robyn told me that she’s bringing over when we written on each other’s wall on Facebook the night before, and a box of cookies that her dad brought over from Taiwan. It’s a cookie bonanza! 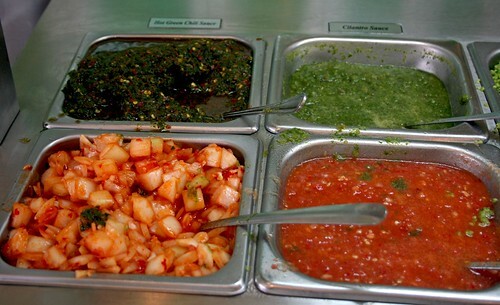 If I was a really young child, I would actually just climb onto the table and eat recklessly until my stomach hurts. But I had my restraints just because I don’t want to ruin my appetite for the fig jam. So, I tried a couple of cookies and they were all pretty tasty. 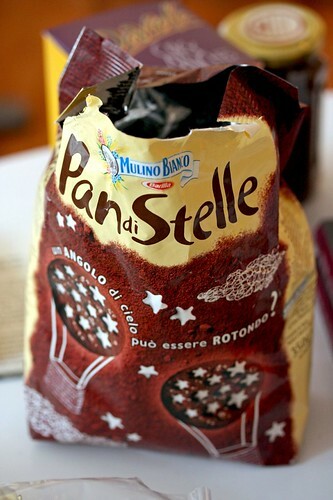 As for the Pan di Stelle, it’s pretty good. Rich, deep chocolate with a hazelnut kick in the background, topped off with cute little stars. Robyn said they’re like the potato chip equivalent of a cookie. 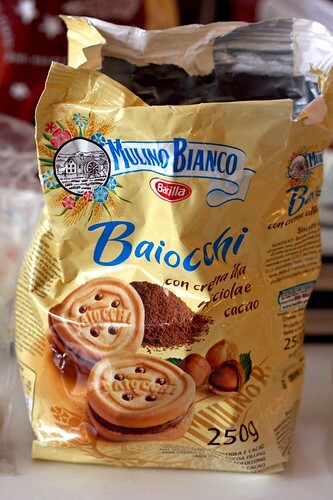 You just have to eat more to get addicted to them. I just ate one and stopped at one cookie because of my earlier explanation. I hesitated eating more cookies just because I’m eating a ton of sugar and I haven’t eaten lunch. 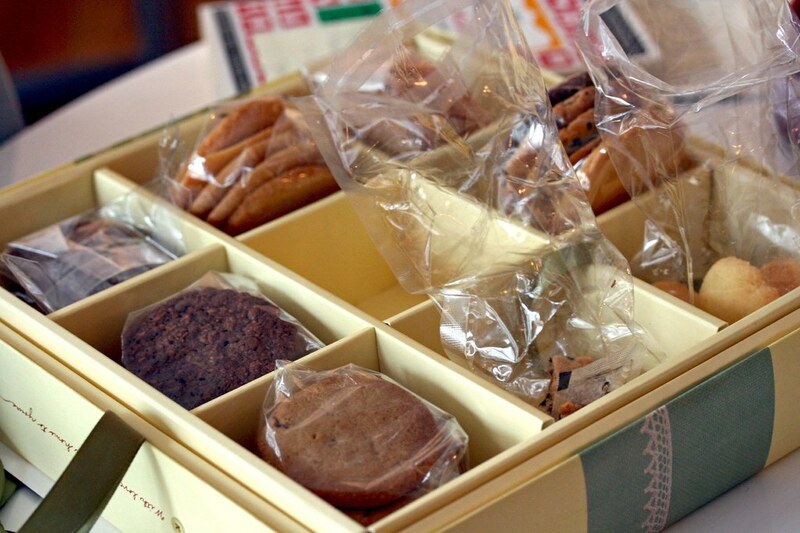 But since that box of cookies that had open bags calling to me and say “EAT ME!” I just grabbed one of them. It’s a small, round, dome shaped cookie that I found out that it’s lemon flavored. It tastes good and sweet enough. 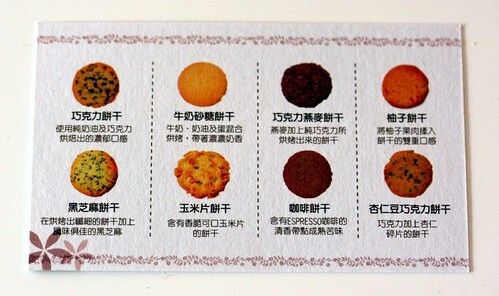 And I found a cookie flavor list, more like a card that has the descriptions of what’s filled in that box. Unfortunately, I am illiterate in Chinese and I speak broken Cantonese. I know, I’m a shame to the ABC (as in American Born Chinese) community, maybe. And I apologize this millions of times to my parents who’ve sent me to Chinese school when I was a kid and wasted their tuition money on that. The only thing that I understood from that card is the only thing that’s written in English, espresso. Ha ha. To those of you who do read Chinese, props to you and you know what’s in that box. After finishing noshing the cookies away and waited another five minutes, saying “hi” to Adam, the man behind Slice and A Hamburger Today blogs, Robyn finally made her presence and gave me the highly anticipated fig jam and the Amedei chocolate that I requested her to bring back from Italy. I ate tried my fig jam with the scone (that I mentioned much earlier on this post) and it’s unlike any other fig jam I ever tasted. It’s pure figs that’s been cooked down to the figgy goo that it becomes after breaking down from the slow cooking processes of jam making with sugar. 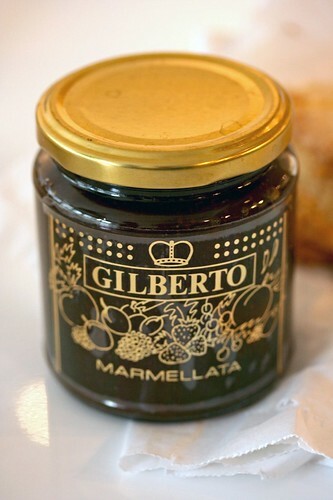 I probably shouldn’t say “goo” since there’s fibers of fig and seeds throughout that jam. It tastes like fig with complex flavors of wine and molasses. It’s strange but it tastes like that just eating it straight out of the jar. What I really like about this jam is that it isn’t cloyingly sweet and none of those artificial crap or corn syrup in it. 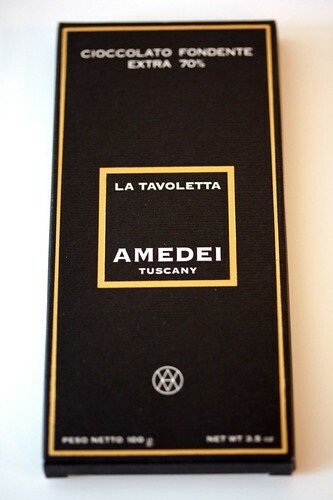 As for the chocolates, I only tried the La Tavoletta Bar. Since Ed was curious about the chocolate since he has never heard of Amedei, Robyn and I told the short story of how and why I asked her to get them for me. Eventually we (all three of us) tasted a piece of this bar and liked it a lot; Robyn a little less just because she prefers sweeter, milk or semi-sweet chocolates. 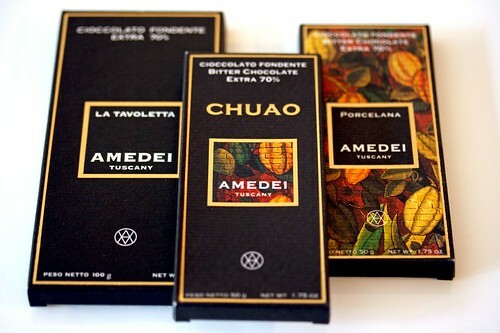 Then our conversation got extended a little with these chocolates, that I should do a chocolate taste test and compare these Amedei bars to some of the stuff in the mass market. 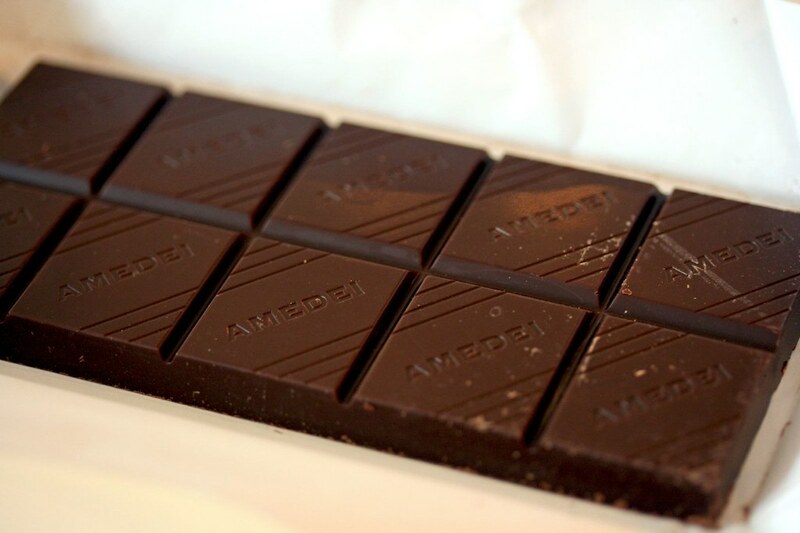 No, I’m not going to compare a Hershey bar to an Amedei bar. That’s an insult and the Hershey bar doesn’t even have 70% cocoa content. I’ve already shopped for chocolate bars (gotten up to seven bars, not including these three) for this tasting but I haven’t tried them yet just because I’m afraid that I would have the psychological effects of not wanting to touch another piece of chocolate once I’m done with them; just like the time with my “best of croissants” that I’ve done about a year ago. Eat a ton of croissants (chocolates coming very soon) and abstain them for almost half a year. I love chocolate too much that I don’t want to hate or fear it. On Thursday, I went to Prune for lunch since I don’t have classes since my professor canceled classes that day so basically it’s a day of hunting for 70% chocolate bars and lunch. After perusing the menu and looking at my neighboring tables what they’re eating, to see if anything look enticing, I just opted for their hamburger on an English muffin since I’ve read so many great things about it. 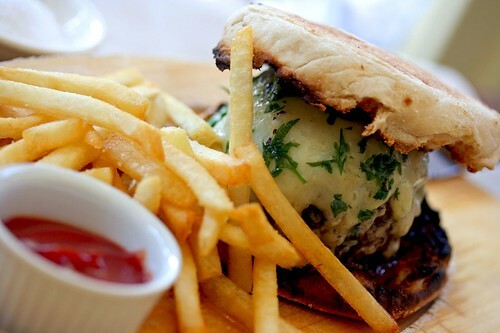 As you can see, this burger is sitting in a shallow pool of its own fat or maybe a combination of the beef and cheese fat, sandwiched between two toasted (almost burnt) English muffin, with a nice gooey layer of melted white cheddar cheese with a sprinkling of chopped parsley. After tasting the first bite, it’s delicious! This huge puck sized beef patty was very well seasoned that it had a salty punch with the cheese and the herbs on top of it was a great symphony of flavors clashing on my tastebuds. 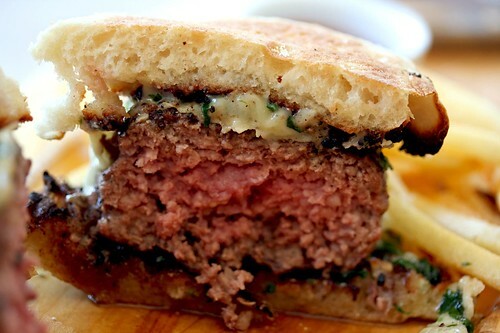 The English muffin was a strange choice initially but it worked well because it’s thin enough to make you focus on the meat more so than the bread or bun that is sandwiching them together yet it gives off that hint of sour flavor to contrast the rich flavors of the burger. It would be better if that muffin wasn’t so burnt. Since their dessert menu is very limited (it’s only flourless chocolate cake with a salted caramel sauce, lemon ice cream or a mixed berry tart), I walked over to Russ & Daughters for their halvah since Kathy have praised them of their halvah amongst the plethora of stuff she’s mentioned that it’s tasty there. Since I trust her tastebuds, I might as well give them a whirl since I never had halvah before. 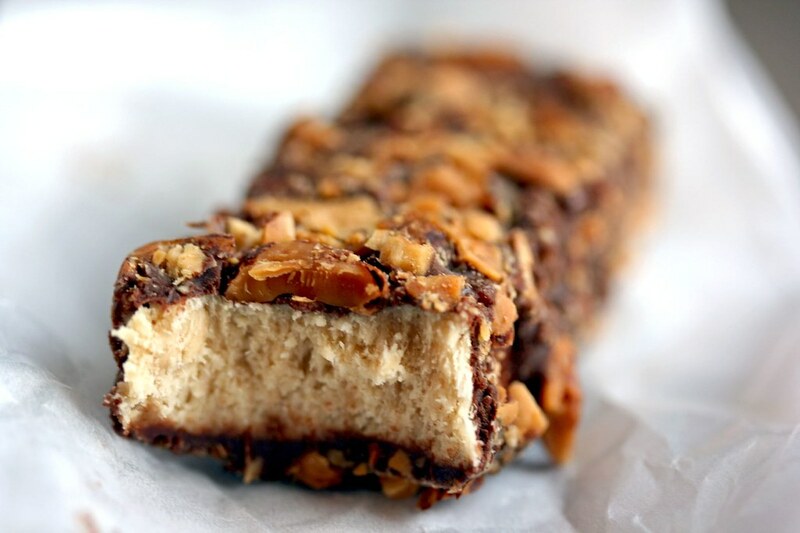 I ended up getting myself an almond covered halvah bar. It’s a very tasty confection. 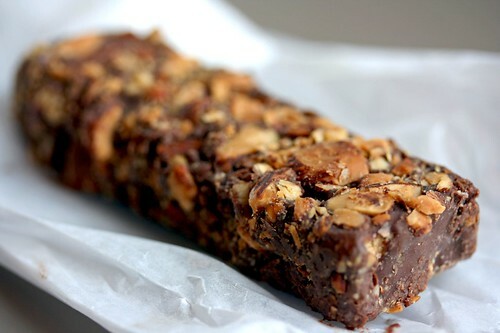 The roasted almonds meets semi-sweet, 56% (no more than 60% from tasting it) chocolate enrobed halvah is so good. What does halvah taste like exactly? Well, to me it’s a lightly nutty sweet that has the texture of layers of tuiles being bitten, it’s texturally light yet satisfy my aching sweet tooth.